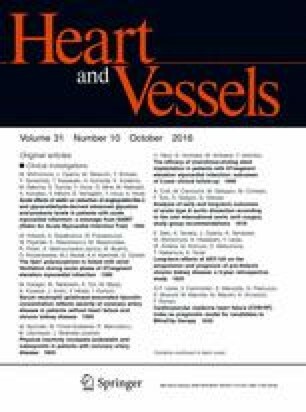 Experimental ischemia–reperfusion models have shown that 3-hydroxy-3methylglutaryl coenzyme A (HMG-CoA) reductase inhibitors, statins, have cardioprotective effects. SAMIT (Statin Acute Myocardial Infarction Trial) is a multicenter prospective open randomized trial, designed to evaluate the effects of statin treatment from the earliest stage on cardioprotection in patients with acute myocardial infarction (AMI). Patients were randomly assigned to receive atorvastatin (initial dose of 40 mg at admission followed by the maintenance dose of 10 mg/day for 30 days) or not (control), and then immediately underwent percutaneous coronary intervention (PCI) for the culprit lesion. The primary endpoints were infarct size and left ventricular function. The secondary endpoints were major adverse cardiac and cerebrovascular events (MACCE) and various biomarkers. There were no significant differences in baseline characteristics between 2 groups of the statin treatment group and the control group. The left ventricular ejection fraction increased at 6 months after the onset of AMI, compared with the baseline level in the atorvastatin group (P < 0.05), while it did not change in the control group. Although there were no significant differences in the MACCE, the changes in the levels of angiopoietin-like protein 2 (ANGPTL2) (P < 0.05), and glyceraldehyde-derived advanced glycation end-products, (TAGE) (P < 0.01) were suppressed at 2 weeks in the atorvastatin group, compared with the control group. Statin therapy started early after the onset reduced the levels of ANGPTL2 and TAGE, and thus, might have cardioprotective effects in patients with AMI. The authors thank Sae Katafuchi and Hiroko Takagi for their expert technical assistance during the study. This work was supported by a Grant-in-Aid for Scientific Research from the Japan Society for the Promotion of Science (KAKENHI: Grant Number 22300264; MT). JO belongs to the department endowed by Fukuda Denshi Co, Ltd. SY received honoraria such as lecture fees, from AstraZeneca, Astellas Pharma Inc., Pfizer Inc, Daiichi Sankyo Company, Ltd., Kowa Pharmaceutical Co, Ltd., and Shionogi & Co., Ltd. KN received remuneration, including lecture fees, from AstraZeneca, Astellas Pharma Inc., Nippon Boehringer Ingelheim Co, Ltd., Pfizer Inc, MSD K.K., Daiichi Sankyo Company, Ltd., Kowa Pharmaceutical Co, Ltd., Takeda Pharmaceutical Co, Ltd., Novartis Pharmaceuticals Japan, Mitsubishi Tanabe Pharma Corporation and Dainippon Sumitomo Pharma Co, Ltd. KN also received scholarship funds and donations granted by Astellas Pharma Inc., Nippon Boehringer Ingelheim Co, Ltd., Daiichi Sankyo Company, Ltd., Takeda Pharmaceutical Co, Ltd., Mitsubishi Tanabe Pharma Corporation and MSD K.K.